A common complaint among older adults is loss of physical and mental energy. As people age, their cells' ability to produce energy is diminished. Many scientists believe that cellular energy deficit is a critical factor in the onset of many degenerative problems. The Russian herb Rhodiola (Rhodiola rosea) has demonstrated a remarkable ability to support cellular energy metabolism. Rhodiola promotes higher levels of ATP (adenosine triphosphate) and CP (creatine phosphate) in the cellular power plants known as the mitochondria, thus providing more of the energy molecules needed to perform many daily activities. In a human trial, rhodiola aided exercise endurance after just a single dose. In another double-blind, crossover human trial, rhodiola increased several measures of mental performance, including associative thinking, short-term memory, concentration, calculation, and speed of audiovisual perception. Statistically significant improvements were reported after just two weeks of supplementation. 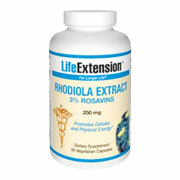 Life Extension members have been obtaining rhodiola in a formula called Mitochondrial Energy Optimizer. In response to growing evidence that rhodiola is an effective way to combat the cellular energy deficit faced by aging adults, Life Extension has formulated a Rhodiola extract for those who want to take higher potencies. The suggested dose of one capsules per day provides 250 mg of Rhodiola Rosea extract. Unlike other Rhodiola supplements on the market today, Rhodiola Extract uses only the authentic Rhodiola Rosea species and is standardized to contain the proven 3:1 ratio of 3 percent rosavins and 1 percent salindosides, matching the concentrations of active adaptogens used in clinical trials. Individuals with anxiety, manic, or bipolar disorder should not use Rhodiola. Take early in the day if Rhodiola Extract interferes with your sleep. other ingredients: rice flour, vegetable flour cellulose. Rhodiola Extract 250 mg - is shipped in a discrete, unmarked package. Orders are processed immediately and usually take about 3 to 5 working days to be received. We do ask that you try it for 2 to 3 weeks to feel the full effects. Any information received is used only for order processing and shipping purposes. Your information, such as e-mail address, will never be disclosed to a third party.